This page describes Mac OSX edition of Ambient, version 1.1, dated 22-August-2009. Ambient is an eccentric MP3 music player program. It is derived from an earlier application developed several years ago for Linux, updated and ported to the Mac OSX Cocoa framework. If you are interested in the Linux version, please see that page for that at http://www.fudco.com/software/ambient.html. Unlike it's older brother on Linux, this version includes an executable binary for Intel Macs so you won't have to build it yourself, but it's intended as a source code distribution, open sourced under the MIT license. Ambient is an MP3 music player program. It was created for two purposes. First, to give me a music player that satisfied my own admittedly somewhat eccentric feature desires. Second, to teach myself about Mac OSX application development in the Cocoa environment. The idea for Ambient came about years ago because I bought a big disk drive, ripped my CD collection (about 400 discs) and found myself with 6,000 or so MP3 files on my hands. The various MP3 player programs I tried out seemed to waste a lot of code on useless features like "skins" while not giving you a great handle on managing a big collection of music files (this was way before the advent of iTunes, which, though loaded with cool features, I still find unsatisfactory on a number of dimensions). Also, the way the MP3 world has developed, there seems to be a strong bias towards thinking of individual songs as the granularity of packaging, whereas CDs and other traditional recording media are structured around the album. This is not to say that the album is a better way to organize music, but simply that that is the way the corpus at hand is already structured artistically so it makes sense to be able to think of things that way when you want to. Finally, I wanted a way to characterize the music in my collection according to various traits that correspond more to mood than to genre: I mostly listen to music while working, and I find that the kind of music that is good for coding by is entirely different from the kind of music that good for debugging by, which is in turn entirely different from the kind of music that is good for writing by, and so on. So I wanted a program that I could just instruct, for example, "I'm debugging now" and have it queue up appropriate material. Then when I shift to writing, tell it so and have it seamlessly shift the mood of what it's playing accordingly. That's a big part of what Ambient does. 1. Download the Ambient distribution image from http://www.fudco.com/software/AmbientDistro-1.1.dmg. 2. Mount the image, extract the contents. 3. If you want simply to use the application, a binary is right there on top for you. If you want to build it yourself (presumably after tinkering with the insides), the folder ambient-macosx-1.1 contains sources and an XCode project file. 4. Put the executable in your Applications folder, if you dare. This program has been tested on and is known to work on (and indeed is used daily on) various versions of Mac OSX, up to the latest as of this writing, 10.5.8. At this point, I suspect it won't quite work on versions older than Leopard (10.5). There is also a Linux version that uses GTK. Information about this can be had at http://www.fudco.com/software/ambient.html. Note that the Mac distribution encompasses nearly all of the Linux source files as well, but you'll need the Linux distribution if you actually want to build the thing under Linux, as there are various ancillary files you will also need. Naturally, all of the interesting activity happens in step 2. What actually happens depends on the command line options Ambient is started with, but broadly speaking, there are batch mode operations and there is interactive mode. Interactive mode, in turn, can interact with you via one of two different UIs: text or GUI. However, the Mac version is primarily oriented towards the GUI and to start it in command line mode you'll actually need to go inside the application bundle to the executable directly (for the adventurous, that's Ambient.app/Contents/MacOS/Ambient). Ambient's model of the world is a three-level hierarchy of artist/album/track. The MP3 collection is a directory containing one sub-directory for each artist. Each of these in turn contains a directory for each of that artist's albums, which in turn contain a set of .mp3 files for the individual tracks on the album. Artist and album directory names are generated from the artist's or album's name by mapping all "funny" characters (basically, everything except alphanumerics, period (`. '), hyphen (`-') and comma (`,')) to underscore (`_') but preserving letter case. The .mp3 file names are generated from the track title using a name of the form NN.TITLE.mp3, where NN is the 2-digit track number and TITLE is the title of the track mapped the same way artist and album names are mapped. Note that this hierarchy and set of name mapping rules is the natural form produced by the CD ripping program I use, Grip (http://www.nostatic.org/grip), or at least it was when I stared using it. Grip has in the meantime changed its name mapping rules slightly, but I've not yet modified Ambient correspondingly. (If you are using a newer version of Grip you may need to do some manual file renaming to make Ambient happy; sorry.) And yes, I know that Grip is not a Mac application. A big item on my todo list Mac version is to revise Ambient to make direct use of iTunes' metadata and music files. Yes, this is a hack. As I mentioned above, I rip CDs using Grip. Grip makes use of the CDDB database at http://www.freedb.org (*see footnote). When you feed a CD to Grip, the first thing it does is query FreeDB using the CDDB protocol, which more often than not will return a listing of the disc's artist, album and track information, saving you the trouble of entering it all yourself (though you will often have to fix typos, spelling errors and creative use of letter case before using this data -- you are dealing here with the Internet hive mind at its simultaneous best and worst). If the CDDB query doesn't turn up any data, then you just have to enter it all yourself after all. Also, I locally modify the artist and album names to follow the comma-mangling conventions described above, which differ from FreeDB's preferred rules for naming things. In any case, the information about the CD is saved in a file which Grip maintains (normally in the directory ~/.cddb). Ambient gets its notion of the names of things, as well as other information such as track lengths, by reading the files in Grip's CDDB cache. This is how you tell Ambient about the arrival of new files in the MP3 collection: you tell it to reread the CDDB cache, from which it will update its .amb file accordingly. Ambient has two ways of deciding what it should play: stepping through a playlist, or selecting randomly based on "mood". The playlist is fairly straightforward. It's just a list of tracks to play. You can add to it by selecting individual tracks, whole albums, or an artist's entire corpus. Once in the playlist, entries can also be selectively removed, or the whole list shuffled or cleared. The entire "mood" mechanism, on the other hand, is a bit peculiar and requires further explanation. The desire to have this mechanism is what motivated my writing Ambient in the first place. The basic idea is that there is a collection of "moods", which are simply symbolic attribute tags that you can define and then attach to particular tracks, albums or artists. You can do a search of the music collection by tag or by an arbitrary boolean expression of tags; the result of the search can be examined to satisfy your curiosity or it can be added to the playlist. 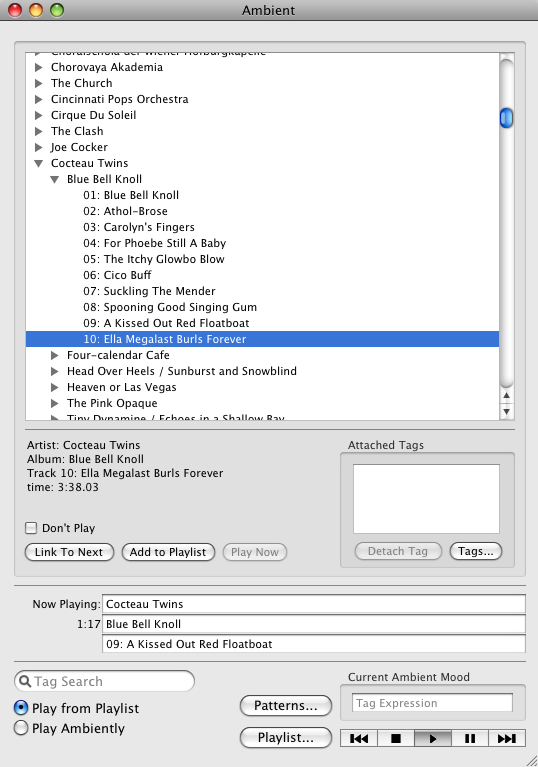 Finally, and most importantly, you can indicate a tag as an "ambient mood" (or, once again, a boolean expression of tags) to the program and it will select tracks at random that match that tag and play them (and though the tracks will play in random order, they won't repeat until they've all been played). This is good for situations that just want to have appropriate background music, like programming or writing. You can link one track to another, so that selecting the first track for play will automatically select the track it is linked to as well. Multiple tracks can be chained together in this fashion. This is useful for something like a symphony, which is typically spread over multiple tracks but really wants to be treated as a single unit (unless you are the kind of person who always prefers listening to selected individual movements, which I'm not). At the top of the window is a large pane that displays the music collection, sorted alphabetically by artist. You can expand a particular artist by clicking on the line containing their name. If you double-click on an artist or click on the triangle, the list expands to include that artist's albums, which in turn can be selected by clicking on them or expanded via double-click into lists of the tracks on those albums. You can also move the your selection up or down by using the up or down arrow keys, or scroll up and down by fiddling with the scrollbar using your mouse. You can also randomly skip to a particular artist by typing the first few characters of their (last) name. You can select multiple things at once with the shift and command keys according to the usual Mac UI conventions. Below the music list is a frame containing controls related to whatever artist, album or track is currently selected. This frame displays summary information about the selected item: in the case of an artist, the artist's name and the number of albums; in the case of an album, the artist's name, the album name, the number of tracks, and the total playing time of all the tracks; in the case of a track, it displays the artist name, album name, track title and number, and the playing time of the track. To the right of the summary information is box showing the attached mood tags associated with the selected item, if there are any; these may be individually selected by clicking on them. The "Don't Play" checkbox manipulates the "don't play" flag for the selected track, as described above. This checkbox is only enabled if the selected item is a track; it does not operate on artists or albums. The "Link To Next" button will cause the selected track to be linked to the track following it. This button is only enabled if the selected item is a track; it does not operate on artists or albums. It will work, however, even if the "next" track is on the next album or even the next artist. If you link tracks, they will be displayed as such in the music display using a set of bracket-like icons. If a track is already linked to another track, the button will instead read "Unlink" and if pressed will remove the link. The "Add To Playlist" button will add all the tracks belonging to the currently selected item to the playlist (excepting those whose "don't play" flags are set, as described above). The "Play Now" button will cause Ambient to immediately begin playing the tracks associated with the selected item. This option is only available if the player is stopped at the time. The tracks will be pushed onto the head of the playlist, so when it finishes playing the selected tracks it will resume playing what was previously on the playlist (if anything was). The "Detach Tag" button, which will only be enabled if a tag is selected in the "Attached Tags" box, will remove the selected tag from the set of tags associated with the currently selected item. The "Tags..." button will bring up the Tags Dialog. The Tags Dialog is used to manage the collection of defined tags. It consists of a list of the currently defined tags and four buttons. A tag can be selected from the tag list by clicking on it. You can also select multiple tags using the shift and command keys while you click. If you double click on a tag, you can select its name and edit it. Clicking the red close button closes the tag dialog. The "Undefine" button will remove the selected tag(s) from the set of defined tags, implicitly detaching that tag from any and all items it may be associated with. The "Attach" button will attach the selected tag(s) to the currently selected artist, album or track. The "New Tag" button will add a new tag (with a placeholder name) to the list. The "Find" button will bring up a search window showing all the items that match the selected tag or tags. Below the music collection frame and its associated controls is a display showing information about the currently playing track: it shows the artist name, album name and track title, plus a real-time counter showing the current elapsed playing time on the track. The "Play From Playlist" and "Play Ambiently" radio buttons switch Ambient between playing from the playlist or playing randomly according to the current ambient mood setting, as described above. The "Playlist..." button brings up the Playlist Dialog, allowing you to view or edit the current playlist. The "Patterns..." button brings up the Patterns Dialog. The "Tag Search" text box lets you type in a tag name or tag expression. Hitting return or clicking the search icon will bring up a search window showing any matching items. The "Current Ambient Mood" box lets you enter a tag or tag expression that will be used for ambient play. The Rewind button (a vertical bar and two left-pointing triangles) will cause whatever track is currently playing to skip back to the start of the track. The Stop button (square) ends the play of whatever track is playing. The Play button (right-pointing triangle) starts music playing according to the current settings or resumes playing after a pause. The Pause button (two vertical bars) pauses play temporarily. Play can be resumed from the point where it stopped by pressing the Play button. The Fast Forward button (two right-pointing triangles and a vertical bar) skips to the end of the currently playing track and begins playing the next track. The Playlist Dialog is used to view and manipulate the playlist. It consists of the playlist itself and three buttons. A track in the display list can be selected by clicking on it. Multiple selection is supported in the usual way. You can close the dialog by clicking the red close button on the window. The "Delete" button will remove the selected track(s) from the playlist; this will not effect whatever track is currently playing, as tracks are removed from the head of the playlist at the time they start to play. The "Flush" button will clear all tracks from the playlist. The "Shuffle" button will randomly reorder all the tracks in the playlist (except that linked tracks will be kept together as a group). Patterns are simply named boolean expressions of tag names and other patterns. They can be used for making more complicated selections of music. The Patterns Dialog lets you manipulate the collection of currently defined patterns. The main body of the dialog window is a list of the names of all the currently defined patterns along with their definitions. A pattern can be selected by clicking on it. Double clicking on a pattern name or expression enables you to edit it. The "Undefine" button removes the selected pattern(s) from the set of known patterns. The "New Pattern" inserts a new pattern (with a placeholder name and empty expression) at the bottom of the pattern list. The "Find" button will perform a search on the current selected pattern. Various operations will bring up the Search Results Dialog. This shows you the set of items matching some tag or tag expression. You can select elements in the result set and add them to the playlist by clicking the "Add to Playlist" button. If no items are selected, the entire search result set will be added. You can also enter a new search expression and search again. An alphanumeric symbol should be the name of either a tag or a pattern. If it is a tag, it evaluates to true or false for a particular track depending on whether or not the named tag is attached to the track or its enclosing album or artist. If it is a pattern, then it evaluates to true or false for a particular track according to whether or not the pattern's associated expression evaluates to true or false for that track. The boolean operator symbols &, |, and ! correspond to AND, OR and NOT respectively. If you don't know what this means, you shouldn't be using this feature. which is all the stuff that matches the first pattern minus all the stuff marked as classical music. Ambient also has a text mode (command line) interface and a batch mode for processing its metadata file. Consult the Linux documentation if you really want to know about these. This thing really ought to use iTunes' metadata and music files instead of continuing to mess around with this silly CDDB stuff. There should be a way to save and load playlists separate from the rest of the database. Non-mouse operation of the GUI could be friendlier. Arguably it would be better to actually use some kind of random-access database instead of rewriting everything on program exit. Life is full of trade-offs. It would be nice to be able to edit the names of things from inside the GUI, rather than having to manually edit the .amb file or one of the CDDB cache files.